My earliest memories of roller-skating featured a slate sidewalk. It consisted of only about 5 or 6 dark bluish-grey slabs. Its smooth, hollow-sounding surface was coveted by skaters because the rest of the sidewalk was the usual noisier teeth-rattling blend of pebbles and cement. In the late 1940s, when a little community still existed in the flatlands of Wheatland, PA, (obliterated in 1985 by a tornado), we kids would gather at the slate sidewalk in front of my third grade teacher’s home on Church Street to roller-skate round and round on it because it was the smoothest ride in town. Those were the days of all-metal 4-wheeled skates, that we attached to our shoes using skate keys. Then in the 1950s we learned about indoor roller-skating rinks. Our family had moved next door to Hanlon’s Hall, a former skating rink with a beautiful wood floor. What a glorious surface we then had to skate on and how much improved were those wooden-wheeled high-top shoe skates! My father eventually purchased the building, renamed it “Angel’s Casino“, and rented it out to skating parties, wedding receptions, civic groups, and teen dances. But it wasn’t the only recreational hall around. Thornton Hall was the nearest popular skating and bowling venue, located close to the border between Sharpsville and Sharon. 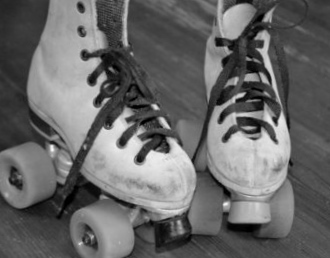 Here are Judy Caldwell Nelson’s memories of roller-skating at Thornton Hall in the 1950s. Thornton Hall, located near the border of Sharpsville and Sharon, PA, was a favorite teen gathering place in the 1950s. Revisited by Ann Angel Eberhardt in 1993. 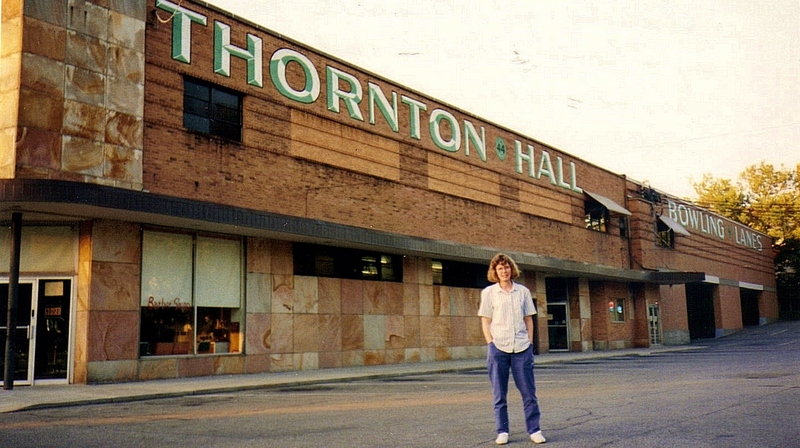 At the corner of Hall and Thornton avenues sat a large brick building named Thornton Hall. The front side was occupied by a grocery store, the term supermarket not yet used, and a pharmacy. The backside was the entrance to a roller rink with a bowling center above. My friend C____ was an excellent skater, frequenting Thornton Hall’s rink on many Friday nights. She owned her own skates and case, sure marks that she knew how to skate backward. I was frequently persuaded to accompany her and had to rent old and smelly skates with an ugly brown stripe down the back marking me as an inferior performer. While the lovely C____ gracefully glided and spun to the organ music of the “flea hop” with partners just as accomplished, I struggled to remain upright along the rail waiting for the next “free skate” announcement. That’s when all the clumsy beginners, like me, took to the highly polished maple floor. Unfailingly, I would fall at least three times during the two-hour skate session and carry home sore buttocks and bruised hips. I never became a good skater and was never asked to skate dance. After C____’s father passed away, she, her mother and sister moved to Florida and my trips to Thornton Hall roller rink ended. C____, a close friend, never offered to show me the finer points of skating. Even though I spent more time sitting out than on the floor, I never got bored, for a great amount of romantic drama could be observed as these evenings progressed. Sobbing girls and pouting boys argued back and forth holding me enthralled with their intense teenage emotions. Class rings were given and returned, sometimes even thrown in the general direction of the owner. The women’s restroom was often a drama queen’s sanctuary. There a sobbing “queen” would be attended by two or three friends attempting to comfort her as she wailed away her latest experience with an unfaithful boyfriend. My big claim to fame at Thornton was being known as the sister of Jack Caldwell, evidently considered a “cool cat” by the girls his age. Oh, the gliding couples! It was Rollywood to me. The music was so beautiful and there was a large spinning globe covered in tiny bits of mirror suspended from the ceiling. During the couples dances, the lights would be lowered and colored spotlights would reflect from that wondrous globe onto the floor. The pastel lights would circle around the floor and the skaters bodies as they moved dreamlike around the rink. My older cousin, V____ C____ was an excellent skater as well as a majorette in Sharon High School. I remember seeing her skating with her then boyfriend with colored lights floating over them as they circled around again and again. Also, my older sister Roberta Jessie Caldwell was a wondrous skater and I enviously watched her many times skating around. She never had a lack of partners. The dedicated skaters wore short skirts, often with net slips underneath. Their skates were beautiful and had special – as in expensive – wheels and toe stops so they could stop on a dime. Like Roberta and my younger sister Irene, I was never a good skater. My partners were always my girl friends. We would join hands and skate around the floor. In this way, we could help support each other and lessen the chances of falling. On cooler summer days we would walk home down Ridge Avenue. with the gentle wind fanning us and rustling the leaves of the maple trees that lined the street. On hotter days we would duck into the Thornton Market and grab a Popsicle to cool us off before our walk home. Brings back a lot of great memories. That was the best place in 50’s. Spent many years at Thornton and the record hops. Good memories.